We arrive at the half way point for the series and things start to take a turn, a turn that gives me final battle with DIO vibes from part III. Bucciarati arrives to deliver Trish to the boss, finally making strides to enact his and Giornno’s plan to screw over the head of the Mafia. It had been so long that I kind of forgot that Giorno and Bucciarati were in bed together (so to speak) in their plan to upend the criminal underworld in Italy. And a good portion of this episode gets into Bucciarati backstory, which surprisingly we had not encountered before this point. We learn he was the son of a fisherman who chose to stand by his weak willed father rather than his strong willed mother during their divorce, because he knew his father would need him more. Apparently, he was more right than he knew. Being witness to a drug deal, his father gets shot seven times, and miraculously survives. 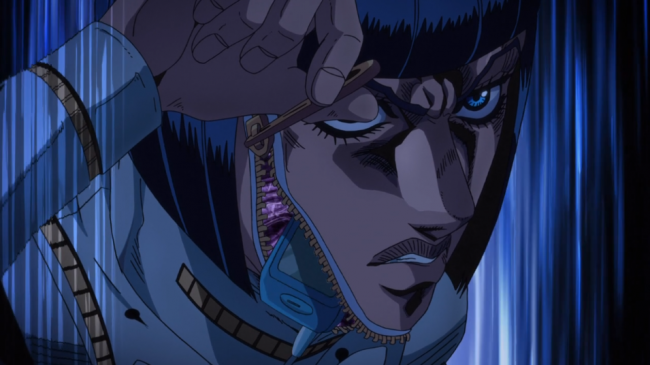 Knowing the criminals would return to finish the job, Bucciarati commits two murders at the age of 12 to save his father. From there he joins the criminal underworld himself to gain protection for himself and his father. Naively believing that the mafia were looking out for the best interests of the innocents, his faith is shook when he realises Italy’s organised crime syndicate facilitate the production and sale of drugs… what a shock. It reinforces why Bucciarati has teamed up with Giorno, who has similar beliefs and wants to take down the organisation from the top. It also gives us some reason for him to want to save Trish, as she finally has a genuine character moment. Worried what will happen to her as she is handed off to one more anonymous, super powered stranger like a piece of luggage. Watching shows like Mob Psycho the same time I am watching this, the character development is being painted with something well beyond a broad brush, more like a fire hose. But subtlety has never been Jojo’s strong suit, and it never mattered before, so the fact I bring it up now is just because I can’t help but take a step back and chuckle to myself. It’s a frequent reminder as to what kind of show I’m watching. In a series of double crosses, both Bucciarati and the boss play cat and mouse for a while, before the episode ends with us learning that the boss’s stand; King Crimson can pull people forward in time. 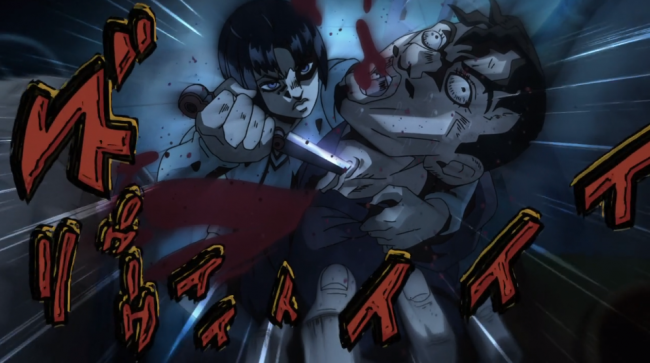 Shortly before impaling Bucciarati with a fist, apparently killing him. There was a time where I felt Jojo’s Bizarre adventure had no qualms about killing off half of its cast. Now though, between Bucciarati and Giorno’s miraculous abilities to heal/repair/close any fatal wound, I don’t think Bucciarati is dead just yet. And if he is, then fair play to this show for surprising me. Because there seems to be a real aversion to killing off character since the days of parts 1 through 3. I’m looking forward to seeing how things progress from here, Jojo’s has always stuck out to me by having really good major villains, and I’m looking forward to learning more about this one going forward. 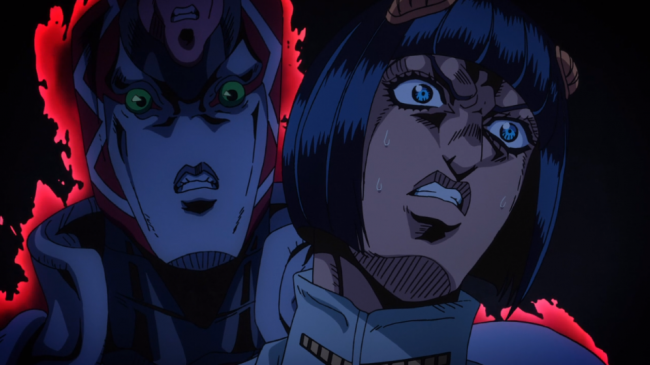 Posted on February 26, 2019 February 24, 2019 by WooderonPosted in Anime, Condensed Reviews:Tagged bruno Bucciarati, episode 20, final mission from the boss, Giorno Giovanna, jojo, jojo’s bizarre adventure, kind crimson. Previous Previous post: Alita: Battle Angel – Does a Middling Adaptation Make a Bad Movie Good?